For those of you getting excited by my title, no, she is not completely eating by mouth yet. But she is completely on real food! Evie just switched this past month to a different "formula" because Pediasure Peptide 1.5 density seemed to be causing her to lose weight. She had been gaining on 1.0 density, but we were trying to help her to cut down on the amount of formula needed to maintain weight and still be interested in food. 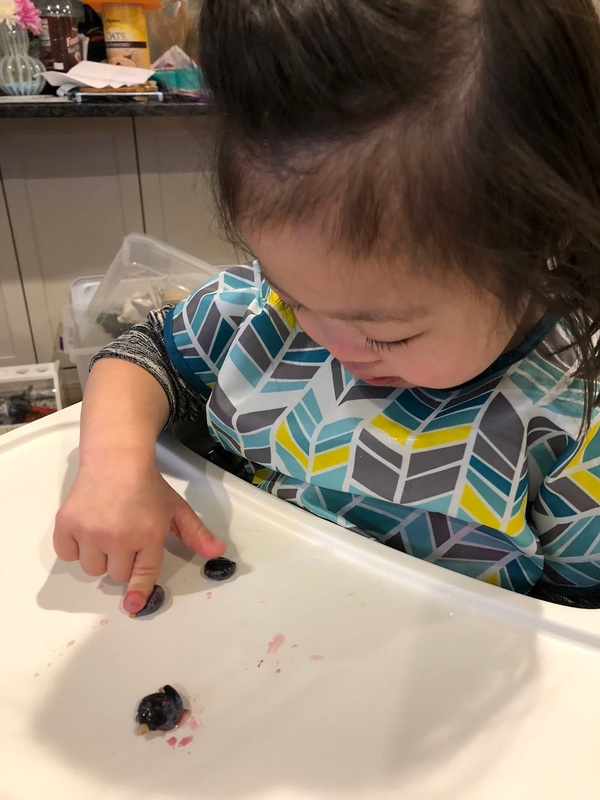 Once she started losing weight, the GI doctor theorized that she was having absorption problems with the Pediasure, and suggested that we just switch her to Real Food Blends or Nourish. Both of these blends are real, blenderized food, and I was a big fan of getting her off of formula. Not only would it be healthier in general, but she might become more regular as well (sorry, TMI, but not sorry). Back in our Pediasure days, we used one can a day and poured some in through the g-tube throughout the day, as you would any liquid with the consistency of milk. In switching to Real Food Blends, this got a little trickier because it's actual food that is more of a pulpy consistency. To illustrate, imagine blending up beef, potatoes, and spinach and then making it go smoothly through a plastic tube. Not easy. One major thing I learned was that coconut milk cans have huge chunks of good fat at the top. 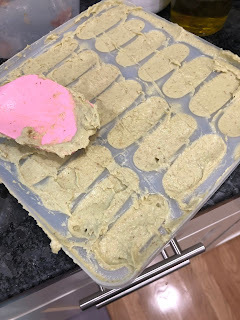 I initially thought nothing of pouring out the liquid and leaving the chunks, and then realized that I was keeping about 30 of the 130 calories in this Trader Joe's can! So I borrowed a hand immersion blender from a friend, and it made so much of a difference. I now pour in the whole packet of RFB, pour in coconut milk to 12 oz on the blender container, and then top it off with water if needed. Then I stick the hand blender inside the container, blend for a minute, and it's ready to use for the whole day! 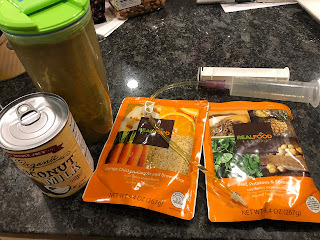 If you're not really sure about Real Food Blends, you can ask your Nutritionist for some samples, or even buy them off Amazon (which is what we did while waiting for insurance to approve). Evie is still eating by mouth! For a month, she didn't gain any weight on the new RFB. The game changer this week was that we gave her 3 cubes (~6 oz) of blended food by mouth instead of the usual 2 (~4 oz), and she ate it all. Add the coconut milk with all the fat, and she gained a whole POUND this last week! I almost fell over in shock. It turns out her favorite dinner is chicken curry. Who would have known. Hope you are all having a fantastic food day like Evie!